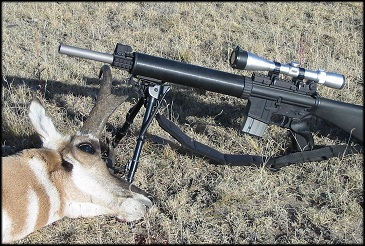 Here are some pictures of the antelope, and the 458. To say that I was and still am on cloud 9, is an understatement. I have always wanted to put a Buck antelope on the wall, as I think that they are incredible trophies. 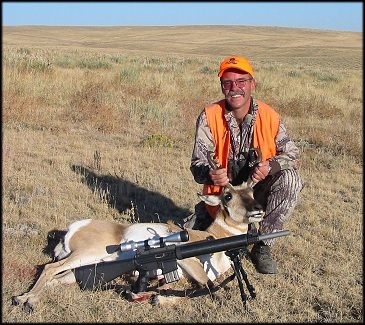 I have no mounts of any big game, as I am not a horn hunter, but this antelope was pretty special. You can see from the pictures, that he is no record book critter. But the effort that went into harvesting him, as well as your effort in creating the 458, have made him pretty special to me. I found him on Saturday afternoon. He was running a herd of 12 ladies, with no other bucks. This was the only herd that we had seen, but we did see a lot of other bucks, single and doubles. When I found them, he was running a very tight ship. The ladies were all bunched together, like a flock of sheep. I watched him for a long time, running around, butting the ladies back in line. I managed to get within 450 yards, but ran out of yucca to hide behind. I moved ahead, and spooked them a bit, over the next rise. I repeated this one more time, only getting back to 450 yards. As this guy deserved more than lead flinging, I decided to let them settle for the evening, and planned a return trip Sunday morning. On Sunday morning, my buddy and I found them about 300 yards from where I had left them. My buddy suggested dropping down into the draw, and trying to get up on them from below. I told him that I tried that twice the evening before, and I wanted to take the long way around, on the high side. We circled way up and around, and found a spot that I guessed they would move to. When I crawled over the top, I found them right were I guessed. I set up in a prone position, and waited. I could just lift my head, and see them moving around. I could not see them on the ground, because of the yucca and grass. I decided to get into my sitting bipod position, and slowy started to get up. Just as this happened, the buck came to my side of the herd, to run one of his ladies back into the group. He spotted my movement, but as I was in camo (and orange), he did not spook. I had put a camo head net over my face and orange hat, and I feel this helped. By the time I was up, sitting, I could tell that I had very little time to think about anything. I put the cross hairs on him, and fired. He dropped at the shot. When we got up to him, I found that I had shot high, and hit him in the spine with the 300 Remington JHP. In my haste to shoot, I had not realized that they were only 75 yards away, and I had left the gun set for a 200 yard shot. According to the book, you never get to shoot them that close, while stalking. So, he is going onto my wall, because he was a pretty dominant buck, with the only herd that we found. He is also going on my wall because I think that I did pretty well harvesting him, executing good judgement on Saturday evening, and stalking almost too close. He is also going on the wall because of your efforts, in designing the 458 Socom, and getting the gun to me in time to make all of this happen. This buck is a far cry from any record book, but it was certainly a culmination of a lot of hard work, by me, and by you. I took a lot of grief from all of my buddies, about shooting a cartridge with such poor ballistics. 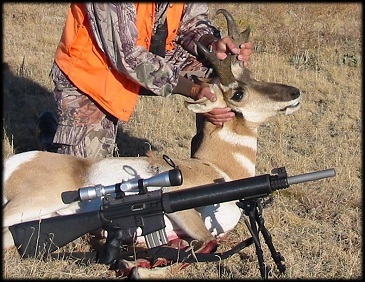 But, I think that harvesting any big game animal is more about the hunter side of the bullet in the gun. P.S. I have a few other trophies from the hunt, that my wife was helping remove from my knee this morning. No proper antelope hunt is complete without cactus thorns in various parts of ones anatomy. I love shooting prone, but it can have it's drawbacks. Send mail to teppojutsu@peoplepc.com with questions or comments about this web site. Copyright © 2011 Teppo Jutsu LLC.